Information in the many World Wide Web pages that are linked to Purdue's official home pages comes from a variety of sources. 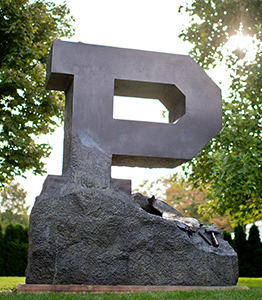 Some of this information comes from official Purdue entities, but much of it comes from unofficial or unaffiliated organizations and individuals, both internal and external to the University. Purdue University does not necessarily author, edit, or monitor these unofficial pages and therefore cannot assume responsibility for their content. All contents Copyright © 2017 Purdue University. All rights reserved. This is an official World Wide Web page of Purdue University. Additional information can be found at the University Copyright Office.